FRIENDS! The Musical Parody is the comedic musical that lovingly pokes fun at TV's Friends, celebrating the adventures of your favorite group of 20-something friends as they navigate the pitfalls of work, life, and love in 1990s Manhattan. It's a typical day at New York's only coffee shop, Central Perk, until an unexpected runaway bride enters the picture and kicks the whole gang out of second gear! 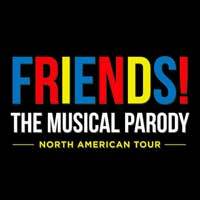 The new musical recreates our favorite moments from all 10 years of Friends through an uncensored, fast-paced, music-filled romp. "...So. If you don't obsess over every past episodes, nothing to see here. If you do, and you go and pre-lubricate the experience, you'll get a party atmosphere among kindred spirits, good-natured amusement, and non-union actors with some talent (Sami Griffith, who plays Jennifer/Rachel is the standout) but without much resemblance to the characters on the show. You don't want to push that parody defense too far. After all, David Schwimmer, who surely would not care for this, often hangs out at Lookingglass Theatre next door." "...Whenever director Tim Drucker's production does make the occasional stab at commentary or originality, it does so by way of bottom-barrel Leno monologue material of the era: Matthew Perry had a pill addiction! The cast made a lot of money! Laughing yet?" "...Friends, The Musical Parody will bring a happy reminisced laughter to your soul and make you glad to revisit Central Perk, and it's well-loved pals named Ross, Chandler, Monica, Phoebe, Joey, and Rachel." "...After leaving the theater, I pondered whether the creators of "Friends!" had actually studied why the TV series became so popular. The creators did sometimes skim the surface of the series to capture some of the in-joke humor, showing that a treasure trove of superb comedy could effectively be mined from the special comic world established by the six characters. But overall, this adaptation does a disservice to one of the great entertainment monuments in television history."